In the year 1900, ad agency Lord & Thomas introduced a novel element to its advertising services: behavioral impact research. Clients were asked to provide mail-order and sales-fluctuation records for the products they advertised, allowing for a before and after comparison. Its Record of Results Department was so successful that within six years, 600 of its clients were using the service. And it was the start of a broader change toward measurable results. It’s been a century since the value of marketing attribution was recognized, and the tools available to us today are far more advanced. Research comes from many places. Data can be 1st party or 3rd party. “Experimentation” isn’t necessarily synonymous with “expensive”. As brands engage with their audience with their audience (and vice versa), there are multiple touch points along the purchase pathway, and they might not all be digital, analog, paid or organic. In short, it’s becoming harder to attribute success, even for something as relatively straightforward as a blog. The best way to track the impact of a company blog is to consider the complex ways individuals engage with it. Some people read articles to research a new idea, others read to confirm an idea they already have and yet others check out content when they’re looking for confirmation that they’ve arrived at the right choice. It would be silly to only consider individuals who read an article as their first interaction with the brand and purchase an item same day. The first step in tracking the value of your blog is to segment out the traffic going to your blog from all of your website visitors. Current best practices recommend having a blog subpage (www.website.com/blog), and this set-up makes it easier to track results than a subdomain (blog.website.com). If you have the latter, it should share the same Google Analytics Property number so you can treat the blog as the hostname, and use a breadcrumb URL structure to make article tracking simple. If neither of these is the case, you have the unfortunate challenge of recreating every relevant page as a regular expression. Pro-tip: When it comes to measuring blog readership, I normally prioritize users above sessions, because users can have multiple sessions and I want to know what the individual does across multiple interactions across the site. There are reports out there that suggest only 50% of AdWords advertisers track conversions, and while I don’t know the percentage of marketers who track Goals in Analytics reports, they too are essential. Lead tracking through marketing automation software like HubSpot or Real Magnet is certainly helpful, but not a replacement for Goal tracking in Analytics because it doesn’t capture the nuances of different traffic segments as effectively. Google does a great job of walking you through the process of setting up Goals. But if the action you want visitors to take doesn’t fall into one of Google’s Goal Types, you can create a traffic segment that meets the criteria for what you consider to be a goal completion. It’s messy, it’s limited in scope, and it’s not as good as doing it the right way, but if you’re in a situation where you don’t have the option of creating standard goals, it can help. Here’s what that segment might look like if your actions trigger event code. You’d want to configure it for the proper Thank You page or ecommerce condition if that’s what matters to you. Goals do take a little time to set up, but they are well worth it because it simplifies seeing how many people complete a desired action (like making a purchase, becoming a lead, or arriving on a thank you page.) Consider adding in a dollar amount, even if it’s an estimate, so you can get an even better feel of monetary impact on site. Once your traffic segment and goals are defined and tested, you’re now able to track performance. Play around and pull different levers! At a minimum, I recommend comparing the blog readership segment to total site traffic, organic traffic, paid traffic and non-blog readership to see how these visitors stack up. If you’re working with ecommerce, you can also compare time-to-purchase, average order value or time of day. By experimenting with the ways that you compare your blog readership to other channels, you can begin to identify which combinations of tactics resonate best with your readers. You can also compare engagement data like bounce rate, time on site and pages per session against the site wide average or competitive channels like paid traffic. The key to reinvigorating your nurture campaign might only be a few clicks away! The value of your blog can’t be measured solely by the new traffic it generates. You also need to look at the organic traffic you’re driving to landing pages through internal links to those pages, as well as the traffic you’re driving to pages deeper in your site. We often see that blog readers are much more qualified visitors because they’ve been engaging with content on your site and learning about your business. With that said, it can still be valuable to take a look how the blog is generating new traffic. To track this, all that’s needed is a quick modification of the analytics segment. Any instance of “page” should be updated to “landing page”. For subdomains, the hostname approach should still work, but you may need to limit the segment to sessions instead of users because the hostname might not represent the first interaction. What this shows you is…. Like I mentioned, a good blog strategy incorporates internal linking. It’s a healthy part of your SEO strategy just like yogurt is part of a balanced breakfast. If it’s the only thing being done, it’s not going to help much, but when done in tandem with other SEO techniques, it should have a positive effect. Additionally, articles should focus on a long-tail keyword, especially if that keyword can be incorporated in metadata like the page title. If your site doesn’t have a Webmaster Tools account for each search engine you view as important, do it now. Google Analytics and Webmaster Tools can be set up to synchronize data, and ultimately Webmaster Tools is going to provide the most actionable data. tail query with that root. 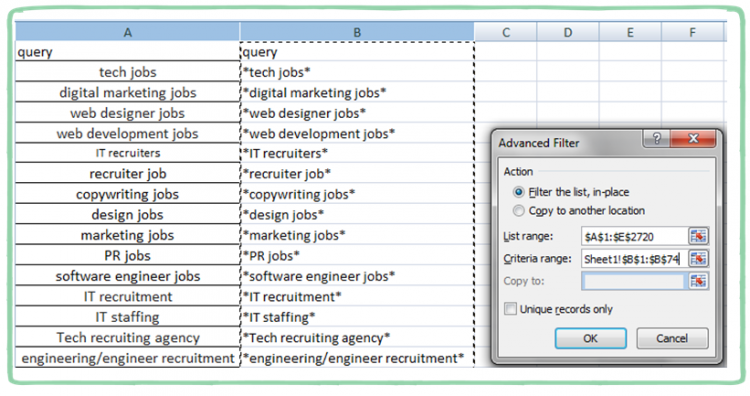 From there, create an advanced filter across the search queries using the starred keywords. I made the column title “query” just for parity; the search query report refers to search terms in the same way. Once complete, you have visibility into which keywords, including long tail keywords, contributed to the site’s overall organic presence! To the best of my knowledge, Google Analytics doesn’t accurately capture all organic search terms that result in a session. If your Analytics profile somehow accomplishes this, a next step would be to update your segment so that each of these keywords are represented. With such a segment, you could track the impact of those specific keywords on your site’s conversion numbers. An alternative approach is to use Webmaster Tools or Analytics to determine the amount of organic traffic you’re getting to your desired landing pages. Webmaster Tools offers this alongside its search query reports, and Analytics offers this through filtering and segmentation. The nice thing about Webmaster Tools in this case is that it can show you which search queries triggered which landing pages to show. If multiple keywords trigger the same landing page, you could filter out the keywords not supported by the blog and attribute a percentage of that traffic accordingly. Either way, by creating a segment that focuses on your target organic search landing pages, you can see the impact of those pages on your site‘s conversion numbers. It’s important to interpret the story the data tells to optimize your marketing tactics. It’s even more important to follow the way that the industry is moving. Nothing stays cutting edge for long in this industry, and as analysis tools become more robust and user-friendly, so too will the extent to which your marketing tactics are data-driven. While the above approaches can help you understand the bottom line value of your blog today, consider how far we’ve come since the dawn of behavioral impact research a century ago. It’s February: Are You Using Expanded Text Ads Yet?